I was thinking this morning about my series of very short stories featuring Oliver. Here’s the most recent published piece, from The Northville Review: In Hoan Kiem Lake. >Hi! This is a hello from Hanoi. 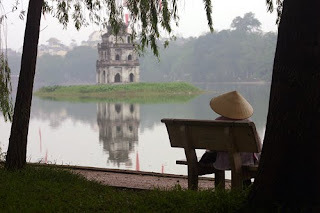 I'm Vietnamese and I live in Hanoi. I'm so impressed by this flash fiction and wondering if you have ever been to my city? >Thank you for your comment. Yes, I have been to Hanoi many times (for work), but the last visit was about 10 years ago.